New 2016 E350 Sedan Owner - Some Questions! I just picked up a CPO 2016 E350 sedan, and it's a wonderful car so far. I recently bought an older CLK320 and like it so much I wanted to trade my Infiniti in for another Mercedes! 1. The map version says 2015, and I wouldn't mind an update. I believe they're free for 3 years, but as mine was delivered in 2015, I think I'm past that. The dealer didn't seem to know for sure, but they looked in the center console and seemed confused that there wasn't an SD card slot, though there is on the dash. I thought that was for an audio SD card, but maybe not. They told me it was $650 for a map update card, though I'm not sure they actually know what I need. Does that sound right? 2. I got setup for my mbrace trial, and I have the Mercedes Me app which works to lock doors, send addreses to nav, and show me where the car is. I'd love to be able to remote start it, but the app doesn't have that option. The mbrace person said it should be available, and to ask the dealer. The dealer told me to ask mbrace, so now I'm in a loop. Remote start is probably the only thing I'd want out of mbrace. 3. One thing I miss from my old car (Q50), was showing the current speed limit on the map. Apparently there is an option to read traffic signs via the camera, but I don't think I have that. Is there any way to show that via the nav data? I've found conflicting info here, with one person saying that if the maps were older than a certain amount, it doesn't show speed limits (which is why I may want a map update). Others have mentioned being able to activate the traffic sign reading feature if the car has the camera, which it does. Not a huge deal, but I miss it! 4. I have an eco button on the dash, which according to the manual is for the AMG version and turns on/off start stop. I don't have an AMG version, and I haven't noticed the car starting and stopping. I actually dislike start stop anyway, so I'm fine if I don't have it, but why is the dash button there? 5. I have a fog light button, but no fog lights. Some on here say that applies to the active LED headlamps, though I have the standard ones. Others say it's for European models that have rear fog lights. Is that just a button that's not actually connected? It does light the fog indicator on the dash when I press it, but I don't notice anything changing on the lights. 4. You have ECO start/stop. It has nothing to do with AMG at all. If it has not engaged you either have not met the parameters that turn it on or your Aux battery is flat. If it will not come on after driving for an extended period, then your battery needs replacing. 5. Your fog light is indeed the Euro version. Your driver's side tail light should be brighter when you flip the switch. Walk around behind the car to verify it is working. Thanks! I did run across the low aux battery thing when searching for eco mode, but as a CPO I just assumed they might have checked that. I'll ask them about that! I get my other Mercedes serviced at an independent shop that always treats me really well, so maybe I'll ask them about that. I was planning to do my routine service there anyway. 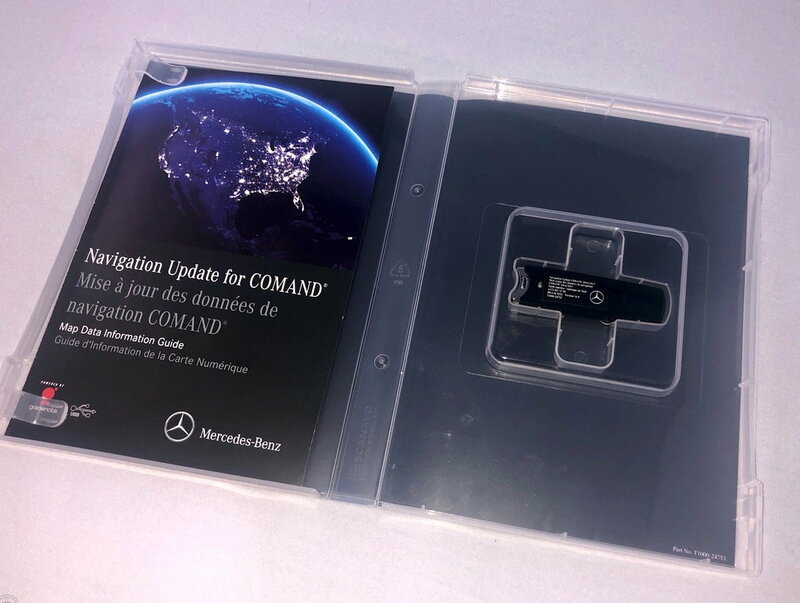 For USA models: The nav map data update is contained on a USB drive(see pic) and updated via the USB port in the center console. The dealer will need to order the correct USB drive for your model and also go into their dealer's VeDoc system and retrieve a six digit code that is unique to your VIN. This six digit code is required to activate the new map data. The dealer should then keep the USB drive so you are not billed for the update. Normally if remote start is not available in the mbrace/Mercedes Me app after your setup, then that feature is not available for your car. ECO start/stop is standard and it will not function right away cold. Several things need to be ready after driving for a bit, then when it determines all is good, when you come to a stop, it will shut down the engine and start it again when you press the gas pedal. Another great feature is brake HOLD. Once you come to a stop, if you press the brake pedal a little harder than what it took to stop, the word "HOLD" will appear in the instrument cluster and the brakes will hold the vehicle (like sitting at a long stop light) and once you press the gas, it will automatically release. HOLD will work with ECO start/stop also. As for the rear fog light button. I have noticed too on my 2014 E250, that when the rear fog light button is pressed, the front LED headlamps will readjust their position to look more down and out. You can test this by sitting in front of your garage at night when the lights are shinning on the door and press the rear fog button, you should notice the headlights move slightly. And as you might already know, the LED headlamps will follow the steering wheel input as you drive. Auto high beam is on by default with the headlamp switch in the Auto mode so if your high beams don't seem to work, it's for that reason. If you want manual control, move the headlamp switch one click to the right. USA models do not have the traffic sign assist feature that reads the signs for speed limit from the onboard camera - Euro only I believe. Some models will have a similar feature that is built into the nav data that can display the speed limit (like Apple Maps), but not sure for a 2016 E350. Last edited by UnlikeAnyOther; 11-05-2018 at 03:12 PM. Thanks! I'm pretty sure the dealer was thinking of an SD card update. I wish they were a bit more informed. I don't believe my headlights move with steering, that may only be on the advanced LED lights? I wish I had that, as I especially like the look of the running lamps, but mine don't look bad at all. One more note, I did just go out and verify that the fog light button turns on the rear fog light. I just didn't notice it before... It's somewhat subtle! Yes, but it is a separate LED panel in the tail light at the bottom. I have no idea what that comment was indicating that the lights dip when the fog light button is depressed. I have full LED lighting and I only have the rear fog light like you. My lights only dip on start up during self check. Mine is a 2014. Last edited by KEY08; 11-05-2018 at 08:34 PM. Map update for 2014 is around 280$, my 130$ garmin Nuvi 1500 came with lifetime maps and traffic that I purchased in 2011. Anyway, I don't use much of the car nav, as keith mentioned, my Mobile does it all. On the other hand, if the newer version of maps show speed limit and if you're still interested and the dealer can do it sub 300$ (try another nearby dealer), you might invest on it. I got a loaner yesterday and the Carplay was amazing with Google/Apple Maps on Full screen (2019 C300). 1. The three year map update program begins with the date the car is first put into service, and transfers with the vehicle to subsequent owners. The dealer will definitely be able to tell you this "Date of Service." If your car was placed into service in Nov-Dec, 2015, or anytime in 2016, then you are still eligible without question. The dealer should have their own USB stick -- a shop tool -- they use in updating ALL their cars as needed, so you should not need to buy one just for your use if they grant you the update..
2. If your car is not equipped for remote start, the option will not appear in the Mercedes Me app. You should try the "Send to Benz" upload function. You will like it a lot more than the clunky, direct entry method in Comand. Send to Benz works very well, indeed. It is the one feature I miss since ending my trial. 3. As I understand it, only cars equipped with Distronic will have speed limit display capability. 4. All 2016 W212s come with Eco-Stop. As noted above, a) the auxiliary battery (in trunk) has to be functional, and b) you have to drive the car a while before all the parameters are met to permit it to operate. When it does operate, you will either like it or think it beyond annoying. The button turns it OFF, but the car always starts with it ON. Connecting the dots, the brake "Hold" function also uses the aux battery. So try using HOLD at a stop light to test the battery. If HOLD works, then Eco-Stop should also work, when the system enables it. The dealer should replace a defective aux. battery, because it is one of the paramaters they should guarantee works before stamping your ride "CPO." 5. All models have the fog light button to the left of the rotary light switch. But it is a misnomer, because on cars without actual fogs up front, it functions only to activate the left read fog light so that other deivers following you can see you better in the fog. Last edited by DFWdude; 11-05-2018 at 09:31 PM. 3. As I understand it, only cars equipped with Distronic will have speed limit display capability.. I believe this depends on the year of the car and the maps it is updated with? I got a 2014 one, not sure of the maps version though. I know the self test you are referring to on start up with Full LED lights. KEY08, please try this. At night, pull up to your garage door (about 10-15 feet away) and press the rear fog light button. Watch the light pattern on the garage door. My 2014 & friends 2015 E250's both slightly move the drivers headlamp down just a tad, but pretty far to the left (into oncoming traffic) when the rear fog is turned on (both USA models). Takes about 5 seconds after you press the button. Turn off the rear fog, and it moves back. Works in "Park"
Curious if your car does the same? Hey that’s interesting. I just went outside to try that and nothing happened. I waited several seconds each time and no go. I do have full LED and my lights do the full startup dance, so I assume they are working properly. I was just looking at the manual again, and it does say that “traffic sign assist” is based on the nav data and won’t function if the maps are out of date. It doesn’t mention that it requires Distronic, but the manual isn’t too great at saying what is part of what options. It would be great to know if it is or not, and if a nav update might enable it for me! Maybe the dealer will get back to me. Quick Reply: New 2016 E350 Sedan Owner - Some Questions!